8 Compelling Reasons Why You Need ERP Solution Today! Home 8 Compelling Reasons Why You Need ERP Solution Today! Many small to mid-sized companies believe that they can do without an ERP system. They believe that their operation is simple enough that they can control it with a few spreadsheets or just plain out- dated financial software. So if you are an ambitious company here are some of the most compelling reasons to implement an ERP system. Without an ERP system, your team is flying blind. They make decisions based on guess work or ‘gut feel’ if they don’t have the data they need. Sometimes they are the right decisions, but more often, they are sub-optimum decisions that can cost you money and customer dissatisfaction. Software companies design their ERP systems to support specific industries or verticals. As they add customers, they learn industry best practices and incorporate them into the software. By implementing an ERP system designed for your industry, you automatically make your business processes more efficient & effective. If customers want to know when their order will ship or if you need to know whether you have enough of stock or components to accept a rush order, an ERP system gives you instant visibility into your operations and your supply chain. Customers like accurate delivery dates, and an ERP solution can help you provide up with real-time stock information & delivery schedules. ERP systems calculate and collect costs so you always have an accurate picture of your cost and margins. By helping you to plan more effectively, your operational efficiency will improve. 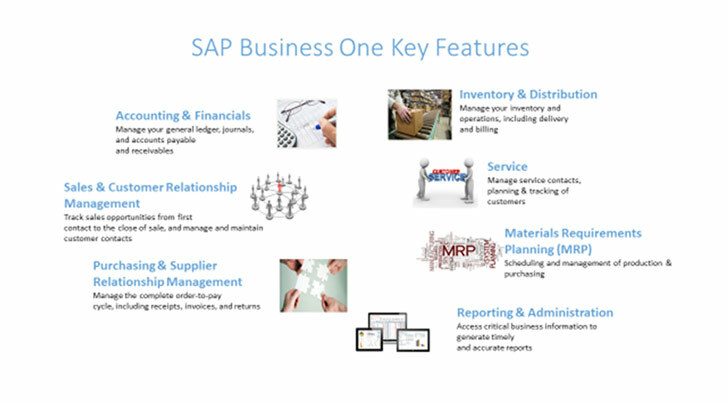 SAP Business One is a cost-effective, easy to use & implement, comprehensive business management solution, catering to the requirements of small & midsize enterprises. It helps SMEs to boost profitability and automate their entire business processes.